The Left has it so hard. They have to keep their wretched belief systems intact no matter how violently the logic bull bucks them. Bush hates gays! Yeah! We hate Bush! Bush's closest confidants are gay! Yeah, we hate Bush! There have long been questions about Rice's sexual orientation and her personal life in general. As Kessler notes, "She has built a wall of privacy around her that is never breached." But Kessler had access to Rice's closest friends and to Rice herself, and he reveals some eyebrow-raising information that hasn't been out there before. In the book and on the show, Kessler described how Rice's "closest male friend" is openly gay, a man by the name of Coit D. Blacker, a Stanford professor (Rice served as the provost as Stanford in the late 1990s for six years) and a Democrat who served in the Clinton administration. Blacker, whose partner is also mentioned, advised Al Gore's campaign in 2000, while his close friend Rice served as a chief confidante for a president who has tried to make gays into second class citizens in the U.S. Constitution. But wait, it gets better. Rice's "closest female friend" is a woman named Randy Bean (pictured here), who is unmarried and whose sexual orientation is not stated. She is described as a "liberal progressive;" she's a documentary filmmaker who works at Standford University and once worked for Bill Moyers. She and Rice and Blacker (again, who has a partner) are discussed as a "second family," a term Bean uses, also saying that, "on friends, [Rice] goes narrow and deep." According to newly revealed information in the book (which Kessler found through real estate records), the two women, Rice and Bean (yes, hilarious), own a home together and have a line of credit together. "for a president who has tried to make gays into second class citizens in the U.S. Constitution" -- Lie, lie, lie. The movement to force gay marriage into the law of the land through the courts, which typically is opposed to 70 percent or so of Americans, and the Prez is merely acting to thwart their assault on our laws and our sensibilities. It's just too ironic. First they were convinced Karl Rove -- wife, kids and all -- was gay, never realizing the irony of having the man who hated gays the most having a gay as the man he trusted the most. Now Karl's gone and rather walk away from their untenable, disconnected position, they have to find a replacement gay that's a Bush confidant. 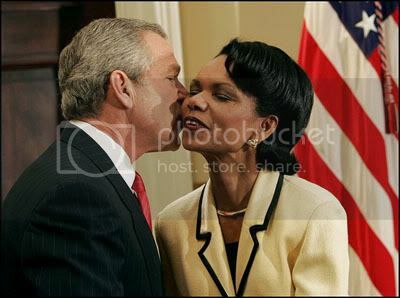 Cheney's daughter's not close enough to the Prez, so they fire up the Condi Rice rumor machine. It's clear that Bush has the same view of most Christians when it comes to homosexuals -- they're guilty of a sinful behavior, sure, but who isn't? We all sin and fall short of the glory of God. There's no reason for hatred, in fact, there's no reason not to be friends or trusted advisors. That the "tolerant" Left doesn't get this says a lot, doesn't it?